This pretty snowflake card cutting file is from the Silhouette store. It's called Snowflake Swoosh by Samantha Walker. Cut out all pieces with my Silhouette Cameo using American Crafts and Bazzill textured card stock. Added a few rhinestones to give it some sparkle. Will be sending this in the package to the Caring Hearts Card Drive. What a pretty card Deloris! 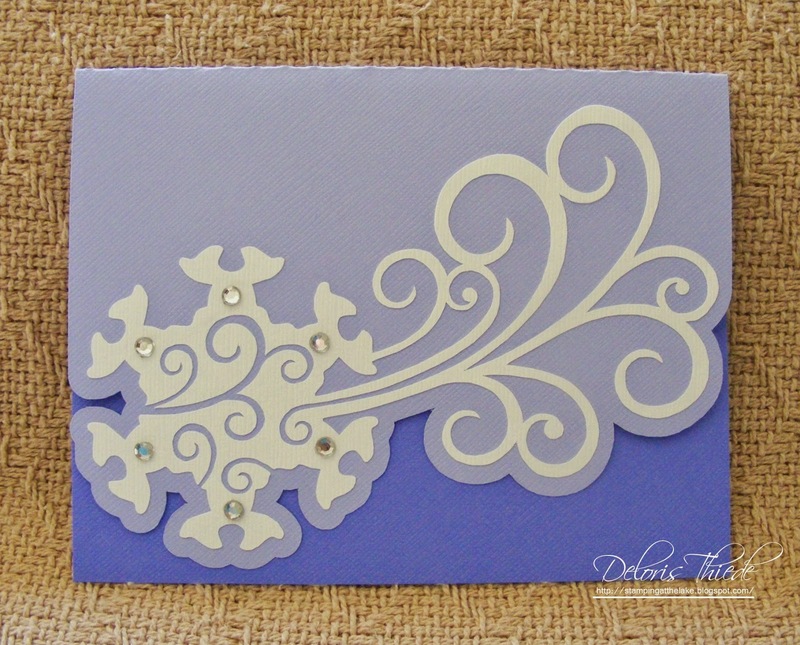 I really like the snowflake swirl and I love how the shape of the card front mimics the die cut. Pretty colours too. OMGosh Deloris, you are on a roll. Another beautiful card for a great cause. You have a good heart. This is beautiful! I remember the winter card you made year before last saying Winter that you got from the Silhouette store which was also beautiful and I still have it. You seem to always pick out the prettiest cuts from the store and bring them to life.